People’s smiles were meant to be complete and to remain complete throughout their entire lives. Those who have lost teeth do not really want to live with missing teeth, and they definitely should not. Throughout history, people have used various ways of replacing missing teeth – the Mayans used seashells as tooth replacements, Gothic culture used wooden dentures, and up until the 18th century many dentures were made from pure ivory so that they would match the other natural teeth. 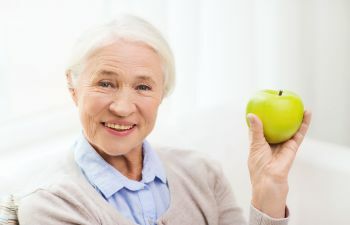 In the 20th century much advancement was made in dentistry and dentures evolved to be more comfortable and dental bridges were created as a good tooth replacement option. However, today there is an even better option available: dental implants. Dental implants have been called the greatest advancement in dentistry. Dental implants provide a permanent solution to tooth loss, which dentures and bridges cannot offer. Dental implants are centered around bone tissue. Many people feel that they can live with a missing tooth, especially if it is not noticeable in the back of the mouth. However, even if others cannot see that a tooth is missing, the jawbone knows that it is gone. The jawbone provides constant stabilization to the teeth so that they are held in place. Without a tooth in position, the alveolar bone begins to resorb, meaning it “melts away.” When the bone begins to weaken, or resorb, neighboring teeth are subsequently compromised. They begin to loosen in the jaw because the bone has softened. The continuation of this process compromises the integrity of the entire mouth. Dental implants, which look and function just like natural teeth, help prevent bone loss. Not only are dental implants attractive, but they become fused into the jawbone itself. The process of bone regeneration allows the jawbone to “accept” a dental implant, and it will grow around the implant anchor as if it were a natural tooth root. This prevents future problematic consequences from occurring, which is why dental implants are such an amazing advancement in dentistry. At Gold Hill Dentistry, we are proud to provide dental implants to patients who have lost one or more teeth. Please contact our practice today to schedule a consultation and learn more about this tooth replacement system.